Generally speaking, the best time to sell or buy the market is usually when it seems like the craziest thing in the world. Everyone is always bullish AFTER a big rally, and bearish AFTER a big decline, but those are the very times to be skeptical of its continuation. 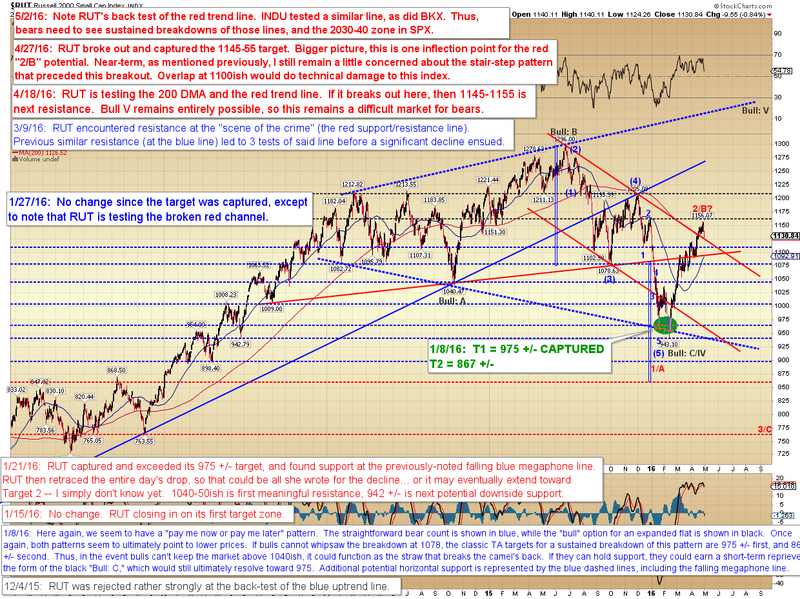 On Monday, I was cautiously near-term bearish; by Wednesday, I was strongly near-term bearish. We got a solid decline after that, so that's going to make people want to be bearish now. That could be correct, but this is where I get cautious again, for reasons we'll examine below. Let's start with RUT. 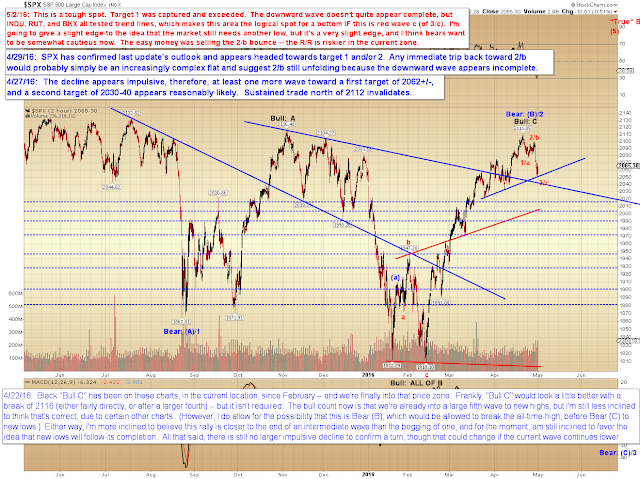 RUT came down sharply and back-tested the red trend line on Friday. So far, it has found buyers at that line. INDU and BKX (not shown) tested similar lines, and also bounced. And that means bears should consider being cautious again. In conclusion, there's a difference between what "looks more likely" from an analytical standpoint and what makes sense from a trading standpoint. From a trading standpoint, the play was selling the 2/b bounce when we had an impulsive decline, a clear stop, and I was strongly in favor of a new low (and the risk/reward was reasonable) -- and then taking/protecting at least partial profits in the first target zone. 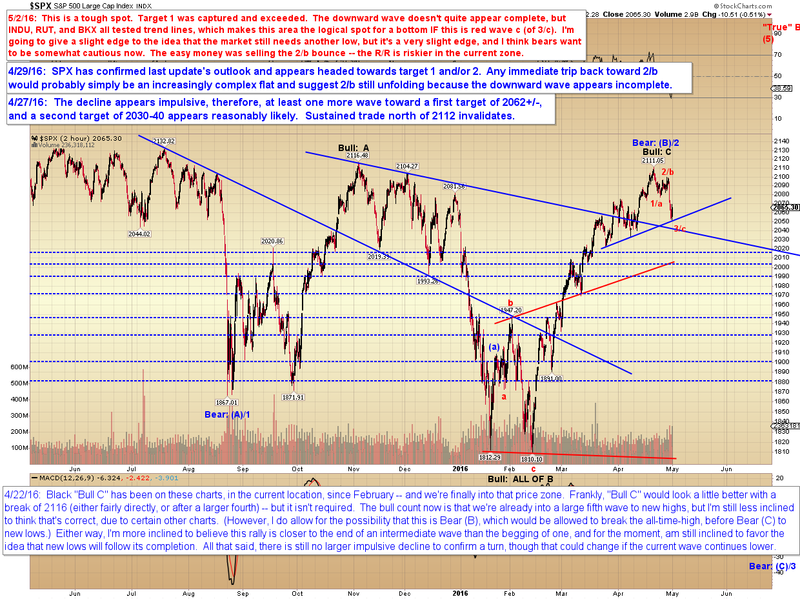 From an actionable standpoint, things are a little more iffy in the price zone as of Friday's close. Analytically, the near-term pattern does look like it may be incomplete, and thus that a new low might be needed, but we do have numerous markets bouncing off trend line back-tests, so bulls may try to defend the zone on either side of Friday's lows. Trade safe.